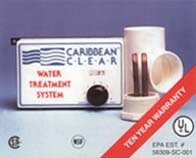 Since the early 1980's, Caribbean Clear products have made believers out of pool owners. From Olympic swimmers to the neighbor down the block, satisfied customers have built Caribbean Clear's reputation. Don't be fooled by cheap imitations or "catalytic" devices. Demand the best for your pool, demand the system that will perform, demand Caribbean Clear! 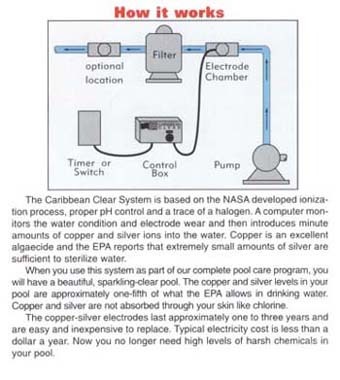 NASA developed the technology that Caribbean Clear uses to purify your pool or spa the safe, easy way. You no longer have to use large quantities of harsh chemicals. Enjoy your pool or spa! » Your water will feel and smell fresh. » Your water will be sparkling clear. » Your swimsuits will stay bright. » Your eyes will feel great. » Your hair will be soft. » You will save money. Imagine your friends saying, "You have such a sparkling clear pool and there's no chlorine smell".